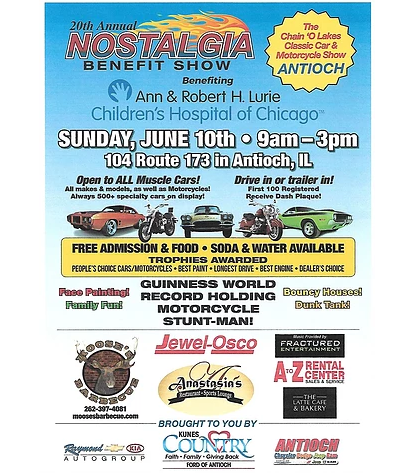 The upcoming Chain ‘O Lakes Classic Car Show in Antioch, Illinois is sure to be a fun-filled family event! You are invited to come by the dealership on Sunday, June 10th, 2018 between 9 A.M. and 3 P.M. to enjoy a day of classic cars, food, games and more. This event will present some classic cars from various eras so you can take a walk down memory lane enjoying the classic makes and models that will be present. Free painting, bounce houses, a dunk tank, and more family fun will be here so your entire family can enjoy a day with us during this benefit show benefiting the Ann & Robert H. Lurie Children’s Hospital of Chicago, Illinois. Come support this benefit event during a day you are sure not to forget!